We all have read the story of Sir Srinivasa Ramanujan in our school time. Srinivasa Ramanujan (22 December 1887 – 26 April 1920) was a renowned Indian Mathematician. 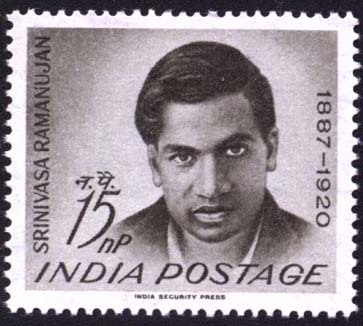 Inspite of having no formal training in pure mathematics, Ramanujan made substantial contributions in the areas of mathematical analysis, number theory, infinite series and continued fractions. He independently compiled nearly 3500 results during his short life time. 1729 came to be known as Ramanujan number, after an interesting incident that took place between Ramanujan & his mentor, G. H. Hardy. Hardy was paying a visit to Ramanujan, who was ill and undergoing treatment at Putney (London). Hardy mentioned to him that he rode a taxi cab, whose number was 1729. "...the number seemed to me rather a dull one", he added. It is said about Ramanujan that the numbers 1 - 10000 were his "personal friends". He could effortlessly tell you their factors, divisors, how the number can be split & the each part of the number can be squared/cubed, etc. to produce interesting numbers, and much more. 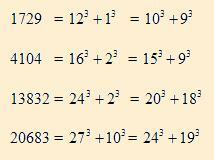 Interestingly enough, Ramanujan replied to Hardy's comment, saying that 1729 is not a dull number at all. It is the smallest number that can be written as sum of 2 cubes, in 2 different ways. This is what Ramanujan meant. After Hardy related this incident to his colleagues, this number became well known and was called as Ramanujan Number. Numbers of the kind a^3 + b^3 = m^3 + n^3 = x^3 + y^3 are now known as Ramanujan Triples. The corresponding problem is known as TaxiCab(3). Numbers of the kind a^3 + b^3 = c^3 + d^4 = w^3 + x^3 = y^3 + z^3 are known as Ramanujan Quadruples or corresponding problem is known as TaxiCab(4), and so on. Infinite RESPECT is actually defined in the world !